When Tony Stark tries to jumpstart a dormant peacekeeping program, things go awry and Earth’s Mightiest Heroes, including Iron Man, Captain America, Thor, The Incredible Hulk, Black Widow and Hawkeye, are put to the ultimate test as the fate of the planet hangs in the balance. As the villainous Ultron emerges, it is up to The Avengers to stop him from enacting his terrible plans, and soon uneasy alliances and unexpected action pave the way for an epic and unique global adventure. I’m going to keep this review short, so that I don’t spoil your experience by spilling out everything. So if you have been following and catching the trailers from Day 1, you would most probably get what I am trying to say. Marvel’s The Avengers: Age of Ultron being one of the most anticipated films in 2015 (Besides Furious 7), so catch it, because no matter how “lousy” or “disappointing” some of the rushed-out reviews or news put it to be, the cast, plot and action is still worth the ticket. In my case, I go wherever the Cap is! I will quote and tweak Spidey’s famous quote, “With great trailers, comes great responsibility.” The trailers for the film has been exciting, and if you think those will just be the most amazing part, you are wrong. The best has yet to come (until you watch it, of course). I would say the action is even better and bigger than before, and this is both good AND bad. The opening sequence is hilarious, action-packed and somehow, it felt like a bunch of alpha-male (male leads) trying to grab the attention of the audience with their muscles and wit. With 6+4+1 Avengers (Captain America, Iron Man, Thor, Hawkeye, Black Widow, Hulk + Scarlet Witch, Quicksilver, Iron Patriot, Falcon+ Nick Fury), this is a MEGA cast. A few reviews mentioned about how the number of characters dilute the plot to make it forgettable, but I thought, this is the Avengers Assemble. They each have their own roles (or films) and we know their characters, traits (good or bad). Their witty interaction, chemistry and messy exchange was what made the assemble great. Stars from each story getting together with the same aim, now cleaning up the mess created by the other made them all a little more human. I felt that the director was a tad too over-ambitious, trying to cram all the big guys and give them all their own little story plus introduce a few badass and mess them up, it was so fast-paced that I didn’t have time to stop to think about the deeper meaning of their lines, be it from the artificial intelligence Ultron, J.A.R.V.I.S, The Vision or Tony Stark’s theory debate with Dr Bruce Banner (Hulk). While the massive over-the-top action have way too much screen-time, overwhelming the audience, it was the short (and surprising) intimate scenes between selected Avengers (namely Hawkeye, Black Widow & The Hulk) that gave the action film a little more depth. Not to forget the viral “Who’s Worthy to lift Thor’s Mjölnir” scene which everyone loves. I love them, but it was too short to penetrate the heart, too little for the audience to develop any deep feeling for the characters. Is it worth a re-watch? Guess what, most might say nay, but it’s definitely an aye for me. Perhaps in slo-mo this time! I love every bit of their (limited) lines. To Note: Stan Lee is hilarious in the film. His favourite cameo so far. Captain America: Steve Rogers is the only Avenger besides Thor who is able to move the enchanted hammer Mjolnir. In the comics, Steve was deemed worthy to wield the hammer. In the teaser trailer, Steve tries to lift the hammer and manages to make it move. The Black Widow: Black Widow declines trying to pull Thor’s hammer. Ironically, in the comics she was deemed worthy to wield it in an alternate reality story. Scarlett Johansson was pregnant during filming of this movie so her scenes had to be shot first before she began to show. To help hide Scarlett Johansson’s pregnancy, three stunt doubles were hired. This caused a lot of confusion among the other actors since, according to them, all of the stunt women looked very similar to Johansson. Chris Evans stated that it got to the point where he would say hello and start a conversation with one of them, only to realize mid way that the person he was talking to wasn’t Johansson. The Ultron:James Spader was Joss Whedon’s first and only choice for the role of Ultron, because of his “hypnotic voice that can be eerily calm and compelling while also being very human and humorous”. He used his natural speaking voice for Ultron, with no accent or alteration of his voice. On his first day on set, the cast was so impressed by his performance that they applauded and cheered for him after his first take. In the comics, Ultron was created by Dr Hank Pym (Ant-Man). Here, Ultron is a dormant project developed by Tony Stark, while Pym gets his own separate story in Ant-Man (2015). Iron Man:In the trailer, Ultron recites “No Strings On Me”, a song from Pinocchio (1940), a Walt Disney film about an inanimate being who gains sentience; Ultron serves as a dark parallel of Pinocchio. Robert Downey Jr. is playing the role of Gepetto in an upcoming reboot of Pinocchio. In comics, Vision was created by Ultron to kill Avengers. In this movie, he’s created by Bruce Banner and Tony Stark, which also explains his colour combination of Red, Green and Golden. Red and Golden are the combinations of Tony Stark’s Iron Man armour and Green is the colour of Hulk. It took Joss Whedon a year to convince Aaron Taylor-Johnson to accept the role of Quicksilver. Johnson was concerned over the intensity of the Marvel contracts, the time constraints, and the fact that it was going to be such a large cast. Even after he accepted the role, he was still nervous, but was comforted after he learned that his friend and Godzilla (2014) co star Elizabeth Olsen would be playing his sister and would be his filming partner through most of the movie. He was asked to lose weight (muscle mass in particular) because he looked too strong to portray a runner, who is usually trim. When Elizabeth Olsen and Aaron Taylor-Johnson learned that their roles Wanda and Pietro Maximoff would be based on their “Marvel Ultimates” version, both actors read and studied every single issue in order to prepare for the role. The Scarlet Witch blasts all the Avengers with visions of people/things/secrets from their past, which shakes and affects them. This incident was taken from the Marvel Comic series “Original Sin”, but there it was the cause of Uatu the Watcher. In comics, Scarlet Witch and Quicksilver are born mutants. In this movie, they got their powers due to experimentation of HYDRA on them. Scarlet Witch’s attire in this film is a tribute to her goth-punk appearance in X-Men: Evolution (2000), where she had on a black dress and red coat instead of a superhero uniform. The addition of Quicksilver to the cast sparked wide discussion over the direction of the character who is also slated to appear in X-Men: Days of Future Past (2014). Quicksilver had been discussed previously as a potential character in both X-Men: The Last Stand (2006) and The Avengers (2012), but legal complexities over the license to the character resulted in his omission from both films. However, in May 2013 both Marvel and Fox Studios announced a resolution to the previous legal issues, and that Quicksilver would appear in this film as well as an X-Men sequel, though under certain parameters: no allusion to his relations to the X-Men or Magneto (the character’s father) can be made in an “Avengers” film, and no reference to Quicksilver’s membership in the Avengers can be made in an “X-Men” film; the rights agreement between Fox and Marvel even goes so far as to stipulate the character cannot be referred to as a “mutant” in any Marvel film. Additionally, the day after Fox announced Evan Peters as Quickilver, Marvel and Fox entered into a legal standoff over provisions of the rights agreement for the character, including the issue of whether Peters would be allowed to portray Quicksilver in any other film outside the “X-Men” franchise, necessitating a second actor to play Quicksilver in any Marvel film, resulting in two different versions of the same character appearing in two competing film series. Joss Whedon wanted to get a “number of different looks and textures and moods” to give the film a different and fresh aesthetic from its predecessor, so he shot in different locations around the world, including South Africa, England, Italy and Korea. The trailer was viewed 34 million times on YouTube in the first 24 hours after it was released. This broke the record that was previously held by Iron Man 3 (2013). Director Joss Whedon says there will be no End-Credit Scene. However the Famous End-Credit “Shwarma” Scene in “The Avengers” (2012) was filmed a week before the film was released. Thanos was considered to be the next villain, but Whedon decided against him in favor of Ultron. He was scheduled to appear for the finale, Avengers: Infinity War – Part I (2018) and Avengers: Infinity War – Part II (2019). Check out Marvel’s The Avengers: Age Of Ultron Official Website and Facebook Page! 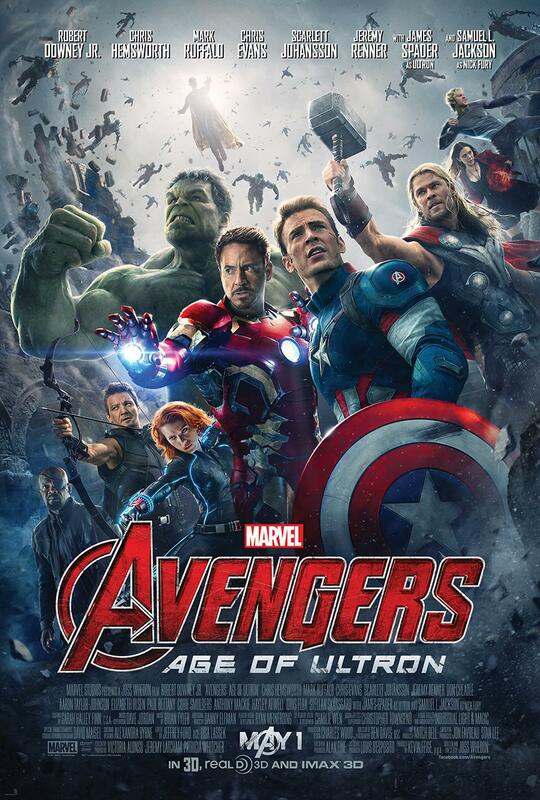 Marvel’s The Avengers: Age Of Ultron is out in cinemas on 23 April 2015. Not having Coulson appear was the best decision they made for this movie. An unnecesarry plot it would have been. I cannot wait to watch this with my hubby. The Avengers franchise is one to be applauded for their effects and storyline so I’m sure this one will be for the books as well. Really, I think it’s like a huge gathering and having all the leads come together is the fun part about the film! I think the difficulties is coming from having too many big name cast sharing the screen time. Of course, it’s still worth to watch. It is already shown here in the Philippines, and the feedback is VERY GOOD! It has a Parental Guidance rating from our MTRCB,.This is good to watch with the whole family. Nice review. I can’t wait to see this film with my grandchild of course. ive watched this today and absolutely loved it! Yesterday only watched this movie and superb it was but always happen to compare the sequel. Really couldnt find scarlett was pregnant at the time.my son even bought hulk mask. I am not a marvel fan or should I say just a seasonal movie goer and enters the cinema that seems “good” but with this review I think i need to watch the first movie prior watching The Age of Ultron. This looks exciting ! I can’t wait to watch this next week! and I didn’t know Johansson was pregnant during filming of the movie. it must have been tough for her.